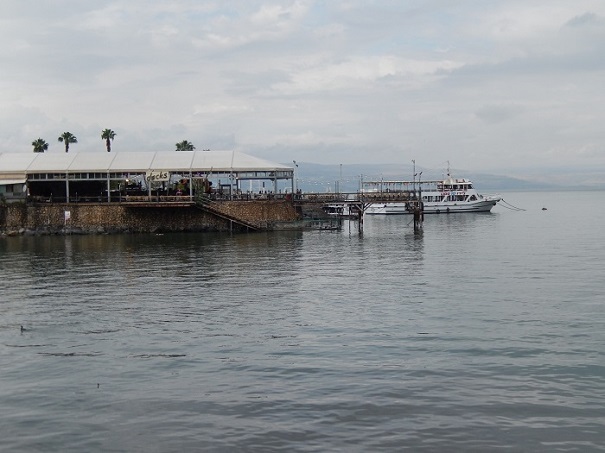 The seaside city of Tiberias was founded around 20 A.D., and today boasts a population of about 42,000. Photo Credit: Benjamin Mack. Immediately taking a left, we came to a large rotunda, at the center of which was a shrine built around what was believed to be the tomb itself. A massive queue of pilgrims naturally snaked around it like an anaconda choking its prey, while black-robed monks with massive beards — the size of which put lumberjacks to shame — patrolled the periphery, chanting in baritone Latin. The sound reverberated from the walls, the ceiling, and the innumerable columns of the upper portion of the rotunda, creating a haunting maelstrom of sound that gave the listener goose bumps while causing the hairs on the back of the neck to stand on end. Who’d have thought visiting such a sacred place would be so frightening? After nearly an hour of waiting, we were finally at the front of the queue. “Come,” a large monk sporting a dark brown ponytail instructed. We entered single-file, each step bringing us closer to a spot many Christians spend an entire lifetime attempting to reach. The smell of incense was so overpowering it made me dizzy. The interior of the shrine, known as the Aedicule, was more like an overly cramped grotto than anything else. Candlelight provided illumination in here, too, reflecting off the walls in orange-red brilliance that seemed somehow more intense than normal candle flames. A single monk greeted us inside, ushering us to duck under a rough stone archway. And suddenly, there we were. The inner chamber was claustrophobically small — large enough for three or four people at maximum — and unadorned save for a small stone shelf upon which were a few candles and an icon of Christ. But the meaning couldn’t have been clearer: this was the shelf upon which Jesus’ body had supposedly laid. It was almost as smooth as marble — another byproduct, no doubt, of centuries of ardent worship — and completely dust and grime-free. The two Eastern Orthodox women with covered heads next to us immediately sank to their knees, kissing the bench with an ardent fervor I’d never seen anywhere; it was likely that, for them, this was the most powerful religious experience of their lives. I too felt something. Whether it was a religious epiphany, or simply being caught up in the general mood shared by everyone else, I didn’t know. But for some reason, I also kissed it. The rest of the afternoon was less spiritual. Meeting up with our German friends/hosts again, we scarfed down some more falafel near Jaffa Road, the commercial heart of the Israeli capital. Slathered with enough hummus to paint a wall, I was left wondering a simple question: why couldn’t falafel be this good back home in Berlin? As anyone knows, the Holy Land is far more than a single disputed city. Learning more about that was our order of business the next day, as we headed through the Dead Sea region and up to the Sea of Galilee, the area where Jesus was said to have lived and performed many miracles. Waking just after morning prayers that could be heard emanating from the towering minarets of multiple mosques not far from the flat where we were staying, our journey began at the Jerusalem Central Bus Station. Known in Hebrew as HaTahanah HaMerkazit Shel Yerushalayim, the colloquially-known “CBS” is the main bus station in Jerusalem and one of the busiest in the country. Located on Jaffa Road, it serves multiple routes, including Egged, Superbus and Dan intercity routes. In October 2013, the Environmental Protection Ministry declared the indoor garage where passengers enter and exit the buses to be “an excessively polluted space and an endangerment to public health,” after previously fining the station over 700,000 shekels for air pollution in 2012. Navigating the bustling shopping mall within that reminded me of the central bus terminal I’d once spent time at in Ankara, Turkey. Weaving our way through the plethora of fresh-faced soldiers who couldn’t have been a day above 20-years-old sporting Uzis and M-16 assault rifles (the station is a favorite target for bombings and other acts of terror), we departed platform 21 on bus number 966, off to one of the lowest bodies of water on earth. A hilly desert landscape formed between 23.8 and 5.3 million years ago — known as the Jordan Rift Valley — passed by as we sat in conditions that could be described as comfortable, depending on one’s perspective. Our green Egged bus — named for a cooperative owned by its members, the largest transit company in Israel that employs over 6,000 workers with a fleet of nearly 2,900 buses that make more than 25,000 trips a day — was nearly completely full, and we were among a very small minority of passengers who were not wearing olive military uniforms or carrying guns. The sight of so many men and women carrying (presumably) loaded weapons on what was supposed to be a public trip to a restive area was just slightly disconcerting. Israel may be a land fraught with conflict both internally (the legal status of Palestine and human rights issues) and externally (frequent wars with neighboring countries), but the area around the Sea of Galilee is known for its numerous holiday resorts catering to beachgoers, sun-seekers, and pilgrims following the so-called “Jesus Trail” that traces 40 miles (65 kilometers) of terrain where Jesus may have walked with his disciples. The sparsely vegetated hills surrounding the wine-dark waters reminded me of the eastern Oregon and southern Idaho high desert, a brutalist environment where only the hardiest people, plants and animals can survive. But the similarities to the Western United States ended as soon as we exited at the route’s terminus in Tiberias, a seaside city of about 42,000 dating to around 20 A.D. One of Judaism’s four holiest cities and boasting numerous hot springs believed to cure skin conditions and other similar dermatological ailments, the city along the Sea of Galilee’s western shore has seen armies as diverse as the Romans, Byzantines, Arabs, Crusaders, Ottomans and British occupy its cobblestone streets. Churches, mosques and synagogues all dot the seashore, almost like a mini-Jerusalem with more water and less people with guns standing around. As any travelers who have trekked through the desert might do, we immediately made a beeline from the bus station and barreled down the boardwalk — barely remembering to pay the bus driver the 44 shekels ($12.64; 9.23 euros) one-way fare — to the sea. The water was even cooler than expected, a frigidity to be expected in, say, the Baltic Sea, but not a place where summer temperatures regularly exceed 100 degrees Fahrenheit (38 degrees Celsius). It also stunk, a decomposing aroma akin to something that had been rotting for several days. But we didn’t let the numbness or foul odor dampen our spirits. After all, when would we be in such a place again? America had a history dating back a few hundred years, but this place had millennia of human habitation to fall back on. Speaking of millennia, we soon decided to sample food that’s been consumed by Tiberias’ residents and visitors for that long time span: fish. Unsurprisingly, the city has a plethora of establishments specializing in aquatic fare, and we settled on a seafood joint along the boardwalk offering unobstructed views of the sea and its far shore. All four gospels of the New Testament recount the story of Jesus feeding a crowd of 5,000 men (not including women and children) with just five loaves of bread and two fish in the vicinity of Tiberias, leaving us feeling just a bit selfish as we split a single baked tilapia (also known as St. Peter’s fish), potatoes, salad, and pita bread with hummus. Puffy clouds passing by overhead — spurred on, perhaps, by a light breeze that also mercifully expelled the decomposition smell from earlier — the white flesh of the fish had a melt-in-your-mouth quality not to be found at chain restaurants or eateries. Had the chef personally caught this particular fish only hours before, waiting until our arrival to sear it on a pan? It was a possibility, anyway. Regardless of its precise origins, the fish was delicious. All the hardship in getting to the Holy Land, the chaos of Jerusalem itself — all of it fizzled away in the serenity of the moment. Preposterous as it sounded, we had found peace in the Middle East. Look out for part two of Benjamin Mack’s adventures in Israel and Palestine.